This project was funded by the Environmental Protection Agency of Ireland, under the ERTDI Programme 2000-2006, Sub-Measure 2: Sustainable Development. 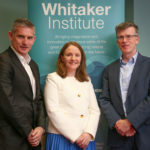 Noting that the integration of economic, social and environmental policies is a formidable task, the programme sought to support government policy by identifying barriers to implementation of sustainable development in Ireland. ENVIRONTECH is a project designed to develop new analytical tools for modeling the environmental and economic performance of companies in Irish industry, test those statistical and case study tools on firms in two industry sectors, and infer policy measures with potential for encouraging business development along a sustainable path.